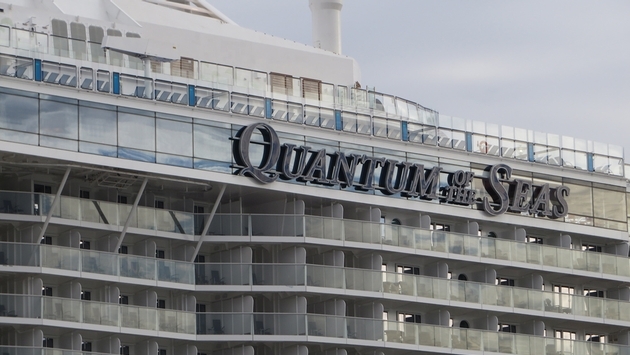 Royal Caribbean International named its long awaited Quantum of the Seas on Nov. 11. The high-tech ship, called a "leap" forward by Royal Caribbean Chairman Richard Fain, was christened by actress and Broadway star Kristin Chenoweth, who has served as the ship's godmother for over a year in various capacities. At 168,666 gross registered tons and carrying 4,180 guests double occupancy, Quantum of the Seas isn't the largest ship in the Royal Caribbean fleet. That honor goes to the twin Oasis of the Seas and Allure of the Seas, both of which displace 225,282 tons and carry 5,400 double occupancy. But Quantum is the third largest ship in the fleet, and the third largest in the world, for that matter. It's also the largest ship ever built by the Meyerwerft shipyard in Papenburg, Germany. The christening ceremony was held in three different venues onboard Quantum of the Seas: The 270 lounge, located on decks 4 and 5, with massive windows overlooking the stern; the Royal Theater, the ship's main stage on Decks 4 and 5; and the Music Hall, the ship's two-level nightclub on Decks 4 and 5. Chenoweth and Fain were located in the 270 lounge, one of Quantum of the Seas’ unique venues for entertainment, offering a wall of glass windows overlooking the stern, as well as a full slate of high-definition video screens that cover those windows, and a set of six robotically controlled video screens that can be adjusted, moved and combined to showcase entertainment. Royal Caribbean used the christening ceremony to demonstrate the capabilities of those screens, as entertainment was piped in from the other two venues for the christening, including a performance by Sonic Odyssey, which features a giant "Earth Harp," and the pipes and drums from the New York Police Department's Emerald Band. Chenoweth also sang "Somewhere Over the Rainbow" just before she officially named the ship. Fain said Quantum represents the next generation of ships for Royal Caribbean, after the Oasis class and Celebrity Cruises' Solstice class ships. "Most thought we would build based on these designs," he said. "We decided to chart a new path….our first goal was to 'wow' our guests. Our second goal was to make [Quantum] a 'before and after' ship." What Fain meant by that, he said, is that Quantum represents a fundamental leap in cruise ship development that people will talk about being a major shift in direction for cruising. Fain pointed out the ship's "smart" features, such as no required check-in; an app that passengers can use to book dining, shore excursions and more in order to plan out their cruise; Royal IQ stations where guests can book dining and other options; a Dynamic Dining program featuring four main themed restaurants instead of one main dining room; and wristbands instead of room keys, among other features. "The fact is we had to raise the bar," Fain said, to create "a new paradigm of what cruising would be all about." Indeed, Fain said that when his team sat down to discuss the new ship's name, when someone suggested Quantum of the Seas, they realized that should be the name immediately, because the vessel represents a quantum "leap" in cruise ship development. 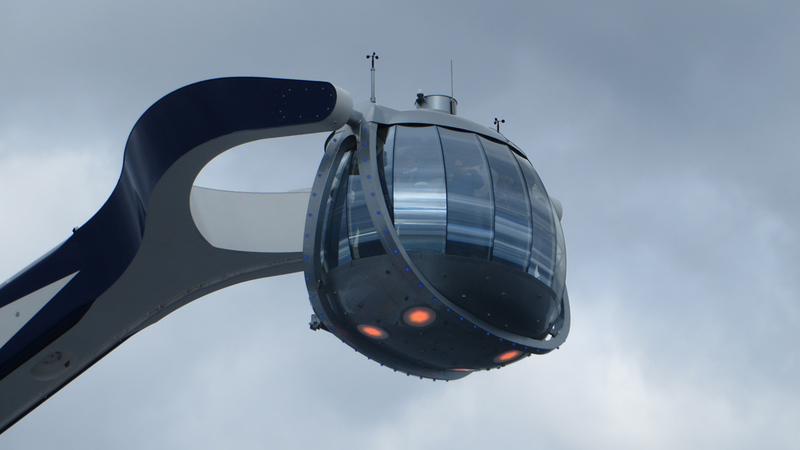 Fain then went on to describe some of the main features of Quantum, such as the iconic North Star, a giant cherry picker-like piston with a car holding 15 that takes passengers high above and to the side for views of the ship and the surrounding ocean. PHOTO: The North Star, Quantum's iconic viewing platform, offers a distinctively different vantage point where passengers can gaze on the ship from above. There's also 270 lounge, with its unique video screens and entertainment offerings. Then there's Seaplex, a giant indoor sports complex that offers basketball, soccer, a roller rink and even bumper cars and a new Ripcord sky diving attraction. In addition, roughly 90 percent of the ship's staterooms have balconies. "Technically this is the most sophisticated ship we have ever built," Fain said. He also called it the "most energy-efficient cruise ship ever built." Fain also extolled Quantum's virtues as a "smart" ship with the most sophisticated and speediest Internet capabilities in cruising. Royal Caribbean turned to O3B, a company that has developed its own communications satellite program to offer Internet around the world. Fain claimed Quantum now features Internet that is better than all the other cruise ships combined in the world fleet. After thanking his executive team, the shipbuilders and the crew, Fain then turned the stage over to Chenoweth, who is the first godmother to be enlisted on an almost permanent basis to promote the ship for the past year. In a duet with the "earth harp" in the Royal Theater, Chenoweth then sang "Somewhere Over the Rainbow," before hitting the switch that released a champagne bottle from the North Star down a zip line into the ship's superstructure — all of which was broadcast on the big screens at 270. PHOTO: Broadway star Kristin Chenoweth, serving as godmother of Quantum of the Seas, sang "Somewhere Over the Rainbow" projected on the giant screens of the ship's 270 lounge. Ironically, after more than a year of promotion, Quantum will be in the North American market out of Cape Liberty, N.J. for only six months. After that it is scheduled to homeport in Shanghai, China, as the first-ever major new ship to hit the Chinese market. When asked later during the inaugural cruise about that move, Fain said bookings in China already justified the decision. He said all the promotion for Quantum had helped Royal Caribbean overall to showcase its technology and innovations. Anthem of the Seas, Quantum's twin, set to debut in 2015, will move in October from Europe to the U.S. market out of Cape Liberty. 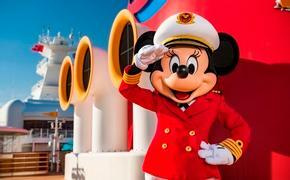 In the interim, Liberty of the Seas will offer cruises out of the New Jersey port. Until then, Quantum will be showcasing its technology and innovations for the North American. Whether the ship represents the new "standard" of cruising, as Fain suggested, remains to be seen, but the vessel, which is both beautiful and intimate for such a large ship, clearly represents a new state of the art, at least until Royal Caribbean builds its next series of ships.